The shorter work week approach to business has been gaining more and more attention. But some companies are still on the fence about whether or not it could provide real benefits. Well, imagine this scenario: It’s 8:30 p.m. on a Sunday. Dinner’s done, the kids are in bed, and Linda is just settling in for a good night’s sleep. But for most working Americans, a more realistic scenario might be: It’s 10:30 p.m. on a Sunday, and Linda is up and about because she just got the kids to settle down. She’s also making a checklist of everything she has to do on her lunch breaks this week. Plus, Linda must figure out when to schedule a vacation day so she can use the time to take the kids to their doctor’s appointments. Not to mention, she’s getting up at 5 a.m. to get the kids ready and off to school before she starts her hour-long drive into the office for an 8 a.m. arrival. This is a snapshot of the daily struggles many Americans face when working a typical 8-to-5 job, Monday through Friday. The United States is behind other countries in the way we work, the number of hours we work, and how we use (or don’t use) our time off. With this being the case, it’s no surprise many people feel overworked. But could a shorter work week be the answer? Explore the positives and negatives of a shorter work week to find out if it’s right for your business. What exactly is a shorter work week? The five-day, 40-hour work week has been around longer than most of us can remember. First introduced in the automotive industry in the mid-1920s, it has simply become accepted as the American way, right? In recent years, compressed work schedules have become popular not only among shift workers, but also with many office workers in corporate settings. As the name suggests, a compressed work schedule “compresses” 40 hours of work into fewer days over a weekly or biweekly period. For example, with a 4/10 compressed schedule, employees might work 10-hour days Monday through Thursday, with Friday off. Or, they could work a 9/80 schedule with nine-hour days for eight days straight, followed by one eight-hour day, which gives them every other Friday (or other weekday) off. Either way, they’re still working a 40-hour work week; they’re just distributing the hours worked each day a little differently. But what if they could work fewer hours each week and get just as much (if not more) done? That’s the thinking behind a new approach many companies are exploring: shorter work weeks where employees work fewer hours, typically 32 hours spread over four days. So, unlike compressed work weeks, a shorter work week actually requires less time on the job. By providing employees with more flexibility and time for themselves, many businesses believe they may be able to improve employee productivity and reduce employee turnover. But not everybody’s a fan. Some opponents of the idea don’t think it’s realistic. They believe it will cause more stress on their employees since they may feel pressured to do more work in less time. Distractions – Let’s take an eight-hour work day. Employees are most productive around four to six hours of that day. The rest of their time, they are probably distracted with meetings or making small talk with coworkers. And once they’re distracted, it can take about 15 to 20 minutes to get back on task. Multitasking – Most people think multitasking is an asset, but oftentimes we aren’t as productive as we think when we try to juggle several things at once. In comparison, when we truly zone in and focus on just one task, we are generally more productive and can then move on to the next task. When you pull the curtain back, you realize employees don’t produce exactly 40 hours a week but still usually hit their goals and deadlines. So, if this is the overall consensus, why do companies push back against fewer hours per week? Because they have a fear of reduced productivity. However, there’s no need to be fearful since studies show people who work fewer hours are still productive overall. What are the positives of shorter work weeks? Shortening your work week could result in numerous benefits for your employees as well as your business. Let’s look at five of the most common. Think about it. If you were to tell employees they only had to work 32 hours a week, with a full weekday off every single week, it would most likely make them extremely happy. And happy employees tend to be more creative, motivated and engaged. Plus, they’re less likely to take sick leave, enabling them to tackle deadlines more consistently and accomplish goals. Many employees become highly focused on their work and are more efficient in a shorter week. They take fewer breaks and zero in on getting work done because they know they have additional time to do what they want or need to do on their off day. The incentive is already built in. At the end of the day, an employee who says they can’t get their work done in 32 hours is likely the exception, not the rule. Employees feel more in control of their destiny when they have shorter work weeks. The constant balancing act between work and life is minimized. For example, if the work week ends on a Thursday, it’s easy for people to plan errands, doctor’s appointments or even weekend getaways to enjoy time with their loved ones. In addition, longer weekends provide the option for more downtime, allowing employees to come back to work refreshed. When Monday comes, they’re more engaged, accountable and responsible – which is what you want from your employees. 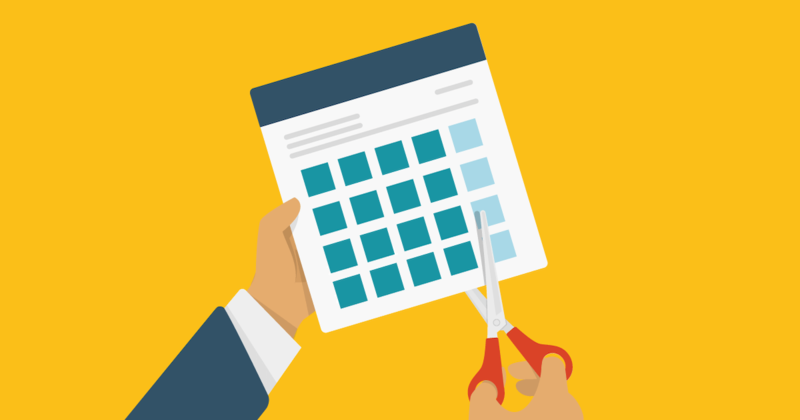 Giving employees an extra day for personal time minimizes the likelihood of them calling in sick or taking an unexpected day off. When they don’t have to worry about rushing around, jamming everything into an evening or weekend, they appreciate it. Plus, they’re more likely to actually start work as soon as they get to work, instead of checking social media or chatting at the water cooler first. A shorter work week is attractive to employees and provides them with lots of flexibility. Flexibility is something many employees won’t want to give up, resulting in a boost in employee loyalty. It could be debated that the more common, compressed 9/80 or 4/10 schedules also provide flexibility. And they do. But only after the employee has put in a much longer work day. Companies that offer a shorter work week are still pretty rare, making it a great perk or incentive for employees and a solid employee retention tool for business leaders. What are the negatives of a shorter work week? Although there are several reasons to offer a shorter work week, it’s not right for everyone. There are some variables to consider before making a big business decision. If you’re a business leader who comes from the “clocking-in-and-out” era, times have certainly changed. For instance, not too long ago, the thought of people working remotely seemed extremely unimaginable. Fast-forward to today and not only is it becoming more acceptable, but many job applicants, especially millennials, expect some type of remote flexibility. Changing mindsets can take time. And when it comes to working a shorter work week, you may still struggle to embrace the idea. But take, for example, how natural disasters used to bring businesses to a halt for long periods of time. These days, many companies are still able to run their businesses with minimal interruption even when their office is damaged from a natural disaster. How? Because their employees are set up to work remotely. It’s all about empowering employees to do their best work. You’re paying them to produce, not just be a warm body at the office. Do you have employees who are accountable, reliable, show pride in what they do and care about customers? That’s what’s important when it comes to the real value of an employee. So, if Susan logs in for work at 8:05 a.m. (instead of 8 a.m.) on a particular day, don’t let it discount the fact that she’s getting her work done – and quite well. This is not to say punctuality doesn’t matter, but it’s just not beneficial to focus solely on the clock. What matters most is what Susan produces by the designated deadline. If the shorter work week sounds intriguing, you still have to face the fact that you may have to change your business’s management style. And this can be unappealing to some. First, you’ll need to retrain your supervisors. It’s important for them to know how to manage their people under this new structure and become better at holding their employees accountable. It’s going to require your supervisors to be much more in tune with what’s going on in their department – and with their people – than they probably had to be before. Supervisors will also need to look at how to do performance reviews, re-set criteria, and be better at helping employees identify goals and objectives. As leadership, you’ll need to make the decision about what’s best for your clients. For example, if having employees work every day is essential to your business, then that’s what you have to do. Yet, if you’re still eager to implement a shorter work week, you may consider staggering employees. This means some team members will have Fridays off and others will have Mondays off. As a result, someone is available five days a week and clients never experience a gap in service. It’s up to you to decide how you run your office and if a shorter work week makes sense for your business. Although employees may work a short week, some never feel comfortable unplugging from work. They constantly check emails and answer calls even on days off and weekends, because they don’t want issues waiting on them the next work day. If a shorter work week is something you want to bring to your team and you’ve outlined things so employees can honestly take off, then it’s up to them to decide if they keep working. Just make sure they understand they’re not required to. How do you structure a shorter work week? Depending on your company and the nature of your business, you can structure your short work week in many ways. For instance, you may choose a Monday through Thursday schedule. Or you might start the week on a Tuesday and end on a Friday. To take it a step further, you may not want to give employees a full day off. Instead, you may want them to work every day. However, you allow them to work fewer hours in the day, making it clear they’re not to exceed 32 hours for the week. It all comes down to a reduction in hours. Is a shorter work week right for you? While a shorter work week has many benefits, it may not be the right fit for every business. The needs of your customers, your industry, and the way you choose to run your office are all important factors to consider. However, if you’re considering going this route, a professional employer organization (PEO) or employment law specialist can provide invaluable advice. Done right, shorter work weeks just might lead to an increase in employee productivity and prove extremely beneficial to your business and bottom line. Want to learn more about how to increase employee productivity and get the HR help your business needs? Download our free e-book: HR outsourcing: A step-by-step guide to professional employer organizations (PEOs).